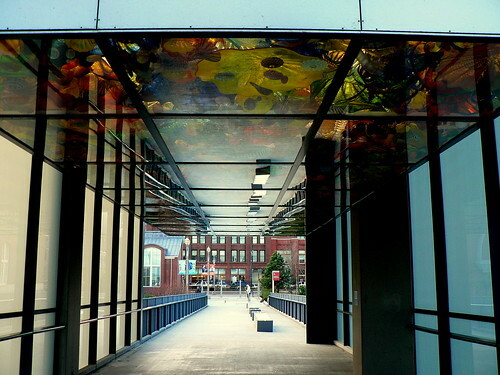 500 feet (152.4 metres) long pedestrian bridge connecting the Washington State History Museum with the Museum of Glass is a visual treat to the visitors and is one of the most famous tourist spot in the town. The bridge conceived by famous glass sculptor Dale Chihuly and designed by architect Arthur Andersson is commonly known as 'Chihuly Bridge of Glass' and showcases three separate art works of the master sculptor. 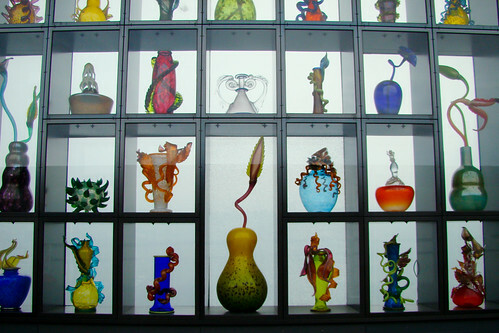 A 50 feet (~ 15.2 metres) long Seaform Pavilion with surrealistic and colourful sea creatures made of glass hanging from the 50 x 20 glass ceiling. 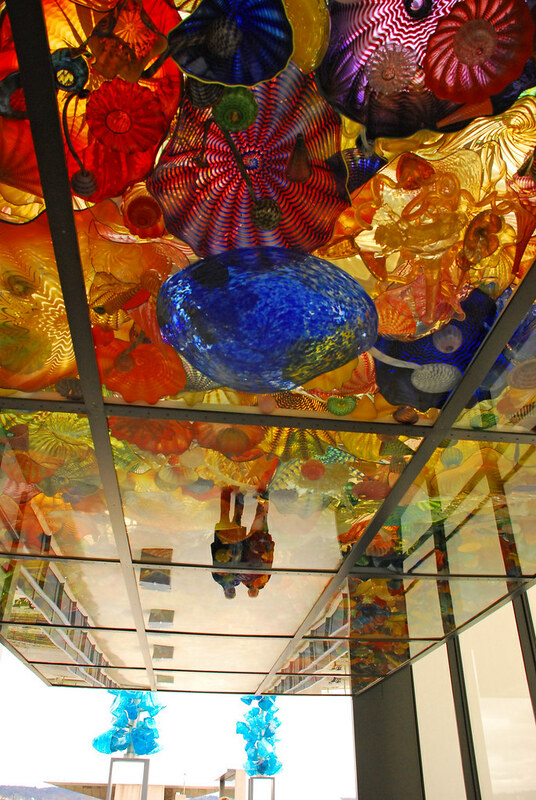 As per artist's web site 2,364 objects are depicted on the ceiling. 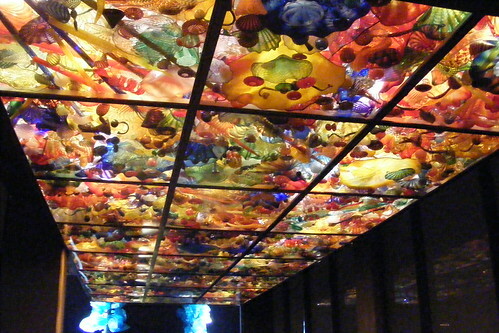 The glass ceiling provides a natural light during the day while at night it is illuminated by fluorescent lights. In the mid section of the bridge there are two 40 feet (12.2 metres) high "Crystal Towers" which are illuminated in the night from the roadbed below. 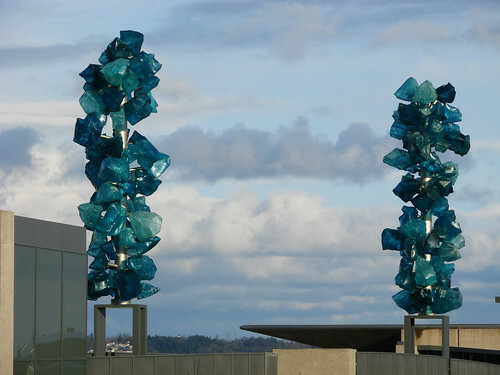 Each tower consists of 63 hollow, glacial blue coloured, large crystals made from weather proof Polyvitro (translucent plastic). Lastly there is a 80 feet (24.38 metres) long racked wall known as "Venetian Wall" which displays 109 small glass sculptures of Chihuly. The racks are made of black stainless steel frames and translucent glass walls which provides natural back-lighting during the day. During the night the artwork is illuminated by Fibre-optic lights. The small sculptures represent three different art forms, Venetians, Ikebana, and Putti. 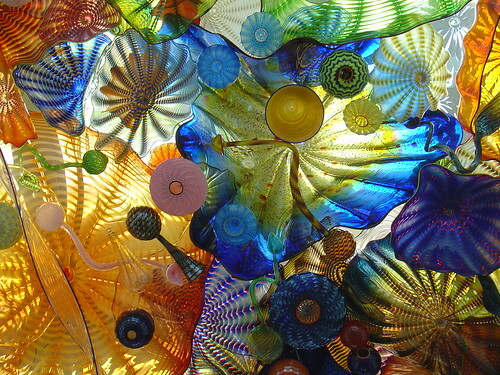 The Venetian Wall has one of the World's largest collection of blown glass art works. 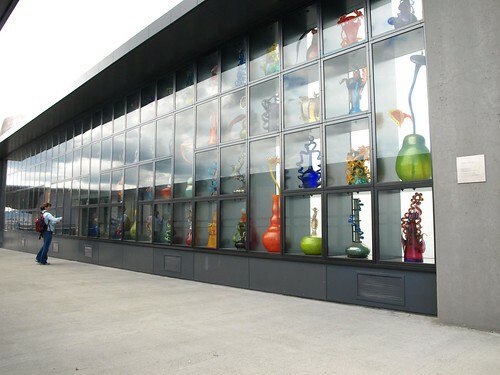 The bridge was commissioned by the Museum of Glass. The design work was started in 1994 and the bridge was finally completed in 2002. 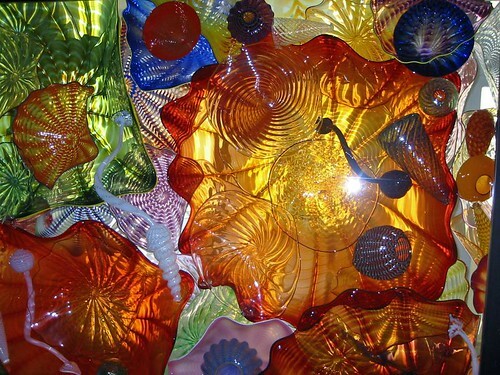 I love Chihuly's art,glass is a favorite medium of mine. We have a couple of his pieces in the Cincinnati Art Museum.